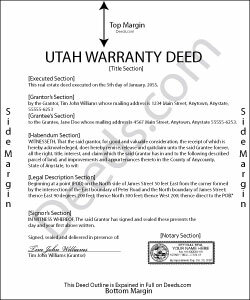 A warranty deed can be used to transfer title to real property in Utah. The statutory form for a warranty deed is provided in 57-1-12 of the Utah Revised Code. A warranty deed, when duly executed, will have the effect of a conveyance in fee simple to the grantee, the grantee's heirs, and assigns of the premises named in the warranty deed, and of all appurtenances, rights, and privileges belonging to the premises named in the deed. The grantor in a warranty deed covenants that (a) he lawfully owns fee simple title to and has the right to immediate possession of the premises being conveyed; (b) the grantor has good right to convey the premises; (c) the grantor guarantees the grantee, the grantee's heirs and assigns in the quiet possession of the premises; (d) the premises are free from all encumbrances; and (e) the grantor, the grantor's heirs, and personal representatives will forever warrant and defend the title of the premises in the grantee, the grantee's heirs, and assigns against all lawful claims (57-1-12). If there are exceptions to any of these covenants, they can be inserted into the deed after the legal description of the property. A warranty deed is customarily used in residential and commercial transactions in this state. To entitle an instrument to be recorded by a county recorder in Utah, it should be accompanied by a certificate of acknowledgment or proof of execution that is signed by the officer taking the acknowledgment (57-3-101). The proof of execution of a warranty deed can also be made by a subscribing witness (57-2-10). A warranty deed must be signed and acknowledged by the grantor. Notarial acts in Utah can be performed by a judge or court clerk having seal, a notary public, or a county clerk or county recorder. A warranty deed can be notarized in a state other than Utah by any of the officers listed in 57-2a-3 or by a person who is authorized to perform notarial acts in the state where such act is performed (57-2a-3). Each real estate deed in this state that has been executed, acknowledged, and certified in a manner prescribed by the Utah Statutes will, from the time of recording with the appropriate county recorder, impart notice to all persons of their contents. A warranty deed or any other conveyance of property should be recorded in the county where the property is located. An unrecorded warranty deed will still be valid between the parties to the document and those who have notice of it (57-3-102). However, an unrecorded warranty deed will be void against a subsequent purchaser of the same property, or portion of it, if the subsequent purchaser purchased the property in good faith and the subsequent purchaser's document was recorded first (57-3-103).